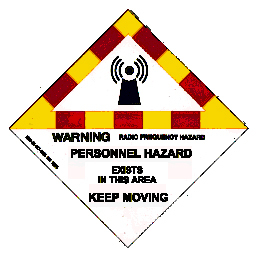 The U.S. Navy, and other highly technical navies, define Hazards from Electromagnetic Radiation to Ordnance (HERO) as the potention for high-energy electromagnetic devices, on ships or closely cooperating aircraft, to produce high-intensity electromagnetic radiation that can cause sensitive electrically initiated devices (EIDs), classically known as electro-explosive devices (EEDs), contained in ordnance systems to actuate prematurely. RFR energy may enter an ordnance item through a hole or crack in its skin or through firing leads, wires, and so on. In general, electrically initiated ordnance systems are most susceptible during assembly, disassembly, loading, unloading, and handling in RFR electromagnetic fields. The potential dangers to ordnance and fuels are obvious because there could be an explosive chain reaction. With a trend to unusual joint operations, such as the USS Kitty Hawk serving as a base for Army helicopters going into Afghanistan in the Afghanistan War (2001-), HERO becomes more than a naval responsibility. For a time, while U.S. Army helicopters could land about U.S. Navy aircraft carriers, they had to first jettison rockets and other weapon systems that had not been specifically tested on the flight deck of carriers. While the exact causes of some catastrophic carrier fires may never be fully understood, there have been disasters in which a single weapon went off through a mechanical or electrical fault, and set off a chain reaction of ready ordnance on deck, and in fueled and armed aircraft. This approach consists of enclosing all EID’s and their firing circuits (including all power sources, transmission lines, and switching and arming devices) within a continuous electromagnetic interference (EMI) shield or “conductive box.” Use of a conductive box requires that proposed design techniques and fabrication methods will ensure that the electromagnetic environments (EME) cannot penetrate into the shielded area. Another method to exclude RF energy from coupling into ordnance is to compartmentalize the system into shielded subsystems connected with RF-shielded or protected interconnects. This technique requires that the RF shielding integrity of each subsystem and of each interconnection be designed so that energy cannot couple into the system at any point. To avoid inadvertent triggering through the firing system, electrical connections when the parts of the system are physically separated. Thus, it is often impossible or impractical to keep all conductors within one continuous shield. Therefore, EM energy must be excluded by some other method. It can be excluded from a shielded enclosure at a connector by means of an EMI filter (a low-pass filter). The design of circuits associated with systems that have electrical connections exposed to Figure 7the EME is very important. RF arcs can occur when connectors are mated and unmated, especially for ordnance that may be attached to very large structures or host platforms that are exposed to high-frequency environments. These arcs can generate EM energy throughout the RF spectrum, including low-frequency components that are in the same band as the firing signal, and will even pass through a filter if one is installed. A break in the firing circuit between the arc point and the EID until after the connection is made will circumvent this problem because a direct current path is necessary for an arc to occur. This page was last modified 00:01, 30 July 2009.